Speedy Catering Available! 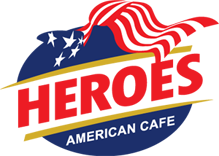 Heroes American Cafe now offers Catering for all Events. Office Parties, Meetings, Box Lunches, Church Events and More. We can deliver sandwich trays, Gourmet Sub Trays, and Wrap Trays in as little as 2 hours! Speedy Catering is here. Let us help you in a pinch.